It’s a herculean task to find wine that is both ready to drink and affordable. One reason for this is the perception of Dolcetto as an ‘early to market’ wine. (Read: can’t age a lick). But there are exceptions, and a huge one is this wine, made by someone that did not know how when she started. It’s quite a story. 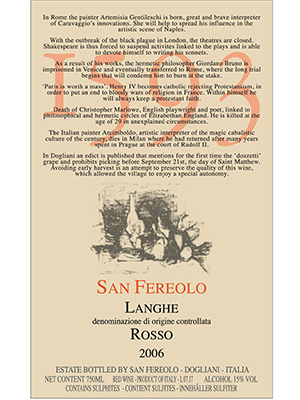 An article by Eleanor Shannon, "San Fereolo: Greatness with Humility in Wine and Life", at her website Uncorked in Italy, describes it beautifully. "...Often the best and most beautiful things in life are not immediately obvious or understood. This is certainly true of Nicoletta Bocca and her extraordinary San Fereolo wines. They open slowly, gradually revealing their greatness. The biggest surprise of San Fereolo is Nicoletta’s Dolcetto, an elegantly robust wine with firm tannins for aging, nothing like a “normal” Dolcetto...."
The bottom line: at 13 years of age, this Dolcetto is fantastic. It’s big. And rich. And chewy. Full-on black cherries on the nose, with sage, smoke and dusty tannins. It’s amazing that this wine can age like it does, but that’s not the main reason to buy it. It’s really good, it’s 13 and it’s reasonably priced. For wine people that embrace the new experience, here’s one you probably haven’t had. Roll it out blind to your tasting friends. They won’t guess it. They shouldn’t. It’s one of a kind. Click here to learn more about this delightful Dolcetto! Available in both 750 ml and magnum.